China faces a critical water situation in the northern part of the country. Ominously, this will only get worse as climate change threatens the Himalayan glaciers that are the source of most of China’s water. Green building strategies can save significant amounts of water use and help alleviate the strain on China’s water resources. In this post, I will describe Water Service/ Savings Companies (WSCOs, pronounced wes-co), a concept that could help China retrofit it’s buildings and factories to use significantly less water. How critical is China’s water situation? Christine Boyle, a Fulbrighter studying water issues in Northern China, gave a great overview presentation on this the other night at Beijing Energy Network, that I will use as the basis for this introduction. Her slides are available here. The statistics on water in Northern China (also known as the Huang Huai Hai river region) are scary: Northern China accounts for 47% of China’s population, 43% of total GDP, and 65% of arable land, but only 19% of water resources. This imbalance has created a significant strain, with water ranging from 350 to 750 cubic meters per person per year. Less than 1000 cubic meters per person year is considered water scarce, the worst classification available. As this graph from Christine’s presentation shows, agricultural use clearly accounts for the bulk of water use. Commenting on how to improve agricultural water efficiency is way outside my competency, so I’ll focus here on domestic and industrial use. Non-agricultural water use is not insignificant, accounting for 35% of annual water use. Now agriculture is a much smaller part of the picture, at only 38%. This situation doesn’t seem likely to ease anytime soon, either. The International Water Management Institute (PDF) estimates that global domestic water use will rise by 71% between 1995 and 2025, the majority of that in developing countries like China. As we can see, more than 80% of water use is for washing things: faces, clothes, bathroom, etc. From this table then, the key water saving strategies are pretty obvious: reduce flow from toilets and faucets and require manufacturers to make water-efficient appliances. Reducing flow from faucets and toilets is just a matter of specifying low-flow faucets and a mix of waterless or low-flow urinals and low-flow toilets. Applying just these basic strategies in buildings can result in large water savings. In fact, according to the US Green Building Council (PPT), green buildings on average save 40% of water relative to standard buildings. Industrial facilities are also a prime source of water conservation opportunities. Of course, for industrial facilities, these fixes won’t be nearly as simple as those described above for buildings, thanks to the more highly designed industrial processes. Fortunately, these are just the types of processes that will be well-suited to WSCO water-saving retrofits. WSCOs are an innovative model to get the private sector to take an interest in saving water. The idea behind a WSCO is essentially the same as an ESCO, but with a focus on water rather than energy. Essentially, a WSCO will partner with a building or factory owner, perform a water use audit and devise strategies to save water. The WSCO then puts up (or raises from outside sources) the capital needed to invest in the water saving strategies. This capital is then paid back through the resultant water savings. Ideally, the savings are large enough that the WSCO gets a good return on their investment and gets to share the savings with the owner. The key attribute of a good WSCO is an ability to take a complex water using system and spot cost-effective water reduction strategies. There are a handful of large, profitable GHG reduction opportunities, primarily located in industrial facilities or huge buildings. The remainder of GHG reduction opportunities are small and fragmented, contained in the “long tail”. I think a closer look at water would show a similar long tail, although I don’t have the data to prove it. As the industry gets off the ground, WSCOs should take their expertise in analyzing water use in complex systems and actually make money in the “short tail” of large, granular water reduction opportunities in factories and large buildings. In contrast to GHG and energy reduction opportunities, many of the long-tail water reduction opportunities are obvious, as described earlier. Building owners and home owners can do the upgrades themselves in order to save water at low cost the next time they move to a new apartment or change their sink or toilet. Of course, a coordinated policy push wouldn't hurt. So why aren't there any WSCOs? A quick internet search showed no WSCOs currently operating in China (although if you know of any, please email me!). Why not? As with any promising green innovation, significant barriers are holding back the WSCO model. First and foremost is economics. 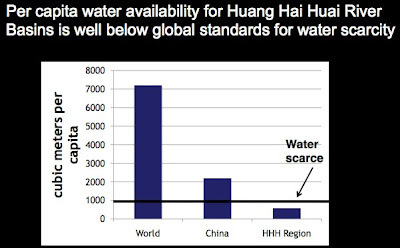 As Christine illustrates in her talk, water prices in Northern China are low. 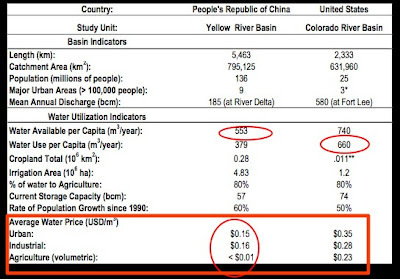 As the chart above shows, urban and industrial prices are about half of those in the also water- challenged Colorado River basin in the Southwestern United States. 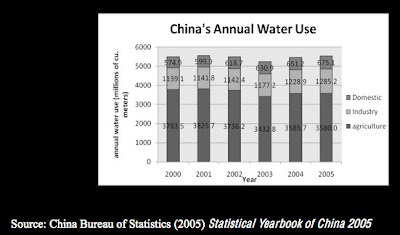 Agricultural water in China is essentially free. For a WSCO scheme to work, water needs to be priced accurately and dearly, since water savings make up the income stream needed to pay back the water conservation investment. The WSCO model might even work on agriculture if the government was willing to clean up the water pricing structure. WSCOs could work with big farms or municipalities to reduce water consumption and share the savings. Given the hard to ignore warning signs of water scarcity cropping up around China, the government will likely be forced to raise the price of water. Potential WSCOs should keep an eye out for government policy action. Government policy will have to drive the move toward efficient water use. Ideally, this will be in the form of a pricing structure that incentivizes entrepreneurial WSCOs to get out and do the work in the "short tail" of water reduction opportunities, but the government will have to do the heavy lifting in the "long tail" by mandating water efficient appliances and raising the price of domestic and agricultural water. Water might become the environmental issue China gets serious about even before they get serious about climate change. But in order to sustainably fix the water problem, climate change cannot be ignored. Maybe an opportunity for WESCOs who focus on both energy and water savings?